Periodically, I receive an email that addresses a topic that I think is worthy of discussion on the blog. I received an email back on February 3rd that I feel falls into this category. It involves a story I have heard many times over the years. I have attached the email in question below. So I stumbled across your webpage earlier this evening while obsessively googling mountain lions. I live in Pilot Point, TX, super small town in the far northeast corner of Denton County. The town is along the northeast side of Lake Ray Roberts. I've lived in this town my whole life, and have heard many stories of Mountain lions, but one story has seriously intrigued me and I need your help. It was brought up to me again tonight, which led me to google and then to you. It's a very known fact around here that we have mountain lions (this is what we refer to them as), but if you ask any wildlife and parks people or game wardens they say that we don't and it isn't true. So, the story goes back in the early to mid 90’s this guy in southern Oklahoma was catching wild hogs, feeding them and releasing them into northern Texas. No clue why. That part isn't included in the tale. As a result, the population of wild hogs grew to insane numbers and they put a bounty on them. Something like 15-20 dollars for a pair of ears. After they realized this wasn't working, it is said, that "they", I've also heard "a guy" released 6 mountain lions (3 males and 3 females) in far north central Texas to "try to control the hogs". But of course, the wildlife and parks people and "those government people" didn't want the public to be aware of this, as not to frighten them. And that's why they deny any accounts of mountain lions. I don't want to throw out this possibility, because I’ve heard of this tale for years now and from multiple people, and I also don't understand why mountain lions existing here is so denied, when it is so known that they are here among the public. But yes it sounds insane and I cannot find any valid information on this. Please tell me if you think the old town folk around here are just crazy. Kodi relays a rumor that has become something of an urban legend here in Texas. The whispers that the Texas Parks and Wildlife Department, the Federal Government or some other entity has released large predators in the state have been around for a while now. The story varies slightly each time I hear it (this is the first time I have heard an Okie blamed for our feral hog problems in Texas, lol). 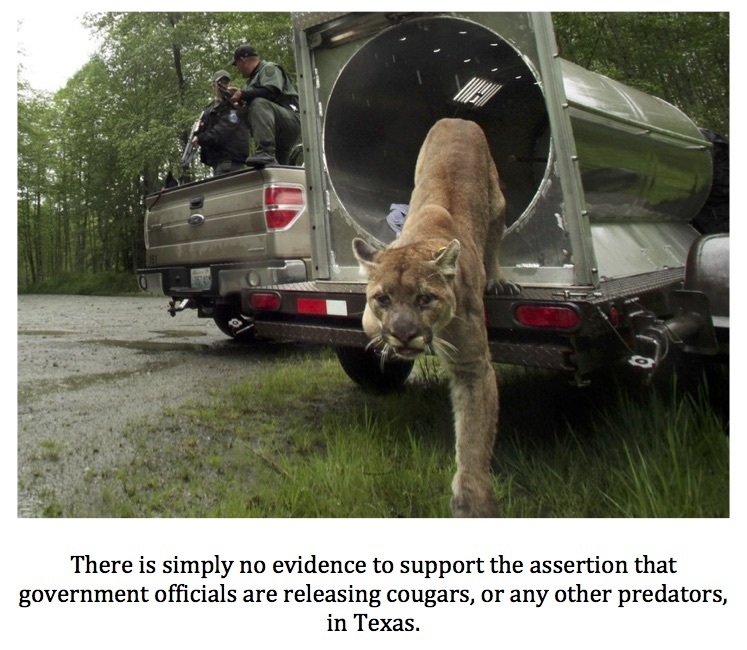 Sometimes it is wolves that were allegedly released, other times cougars. I have even heard some claim that jaguars were the predators released. The reasons for the alleged release of these predators are usually thought to be an attempt to control the feral hog population or a simple reintroduction of native species that once called the Lone Star State home. The reason for the secrecy most often given is that the public would likely not handle the idea of potentially dangerous predators being released in their woods and river bottoms very well. 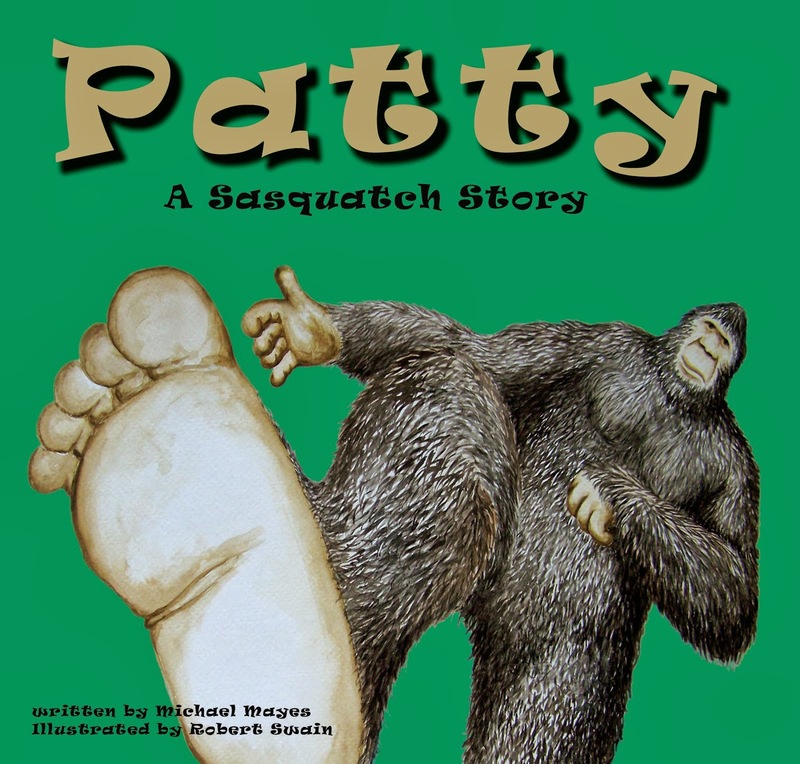 The strangest twist on this rumor I have heard comes from a gentleman I know in Montgomery County, Texas who swears that a friend of a friend received a visit from two “government employees” after he had lost several cows to an unknown predator. According to my acquaintance, these government men paid the rancher roughly twice the market value for his lost livestock in cash but told him to keep quiet about the incident so as “not to alarm others in the area.” I asked my acquaintance if he would relay a message to this rancher through his friend and ask if he would be willing to speak to me, even if it had to be off the record. Needless to say, I have never heard anything back. As far as I can tell, there is no truth to the rumors that wildlife officials are releasing, or contracting anyone else to release, large predators in Texas. I think the myth has gained steam due to the explosion of the feral hog population in the state. Certainly, this hog problem is real and nothing the state has tried to do to curb the population growth has worked. On the surface, the idea of reestablishing native predators to help with the problem seems plausible, as the state/feds would be killing two birds with one stone. Native species, all but extirpated in the state, would once again be living free in Texas and would be helping to eliminate the hog problem. The problem is there is simply no evidence suggesting such a program does, or ever did, exist. All the stories seem to originate from a “friend of a friend” or some other second, third or fourth hand source. I have never been able to track down anyone who claimed they had directly interacted or spoken with any government personnel about the release of predators or reparations for lost livestock. In addition, the story has spread to other parts of the country. Following is a post I located on the Lake-Link Hunting Forum. The post sounds pretty familiar. A friend of mine lives in Southern Marquette county and his wife recently saw a cougar while out on a walk...the cougar was in plain sight and was casually walking in the yard of rural neighbors.... upon reviewing this my friend discovered a few things....that a local farmer had recently reported seeing two cougars within 5 miles of this cougar....then a week ago he ran into a firefighter friend wh0 told him and even more interesting story....basically a person that he knew was going out near some property he has up near Westfield and came across several DNR vehicles in his field...when he approached they told him he had to leave the area immediately even though it was his property...two of the trucks had large cages in the back and one contained a cougar...he left the area went down the road and waited and when those trucks drove past there was no cougar....I know this story is third if not fourth hand so I do not know how much is true but I know the people who have seen the other cougars in the field and I believe them...how they got there who knows...wanderers or released.....but does the DNR have the right to release such animals without public input...I know they have released Wolves in Portage county to help control the deer herd...obviously if they are releasing cougars that could be their only reason....but this animal is totally different than a wolf...while it does not multiply as rapidly as wolves it will stalk a human in the field or a child in a yard....I just thing it should have some public input...what da ya think? Like most urban legends, there is just enough real information wrapped up in the tale to make it at least somewhat believable. Mix in a healthy dose of distrust for the government, which is not uncommon in our country these days, and you have the makings of a great conspiracy theory, an almost gift wrapped and ready made urban legend. In the end, I think an urban legend is all we have here. I am very pleased to be writing this post. 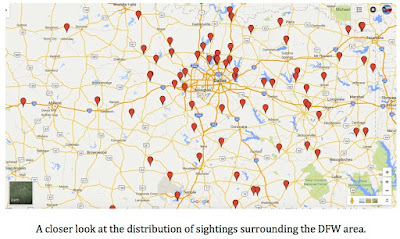 In one way, all I’m doing is presenting a map to you that details alleged sightings of large, black, long-tailed cats. In another way, this map represents more than six years of work and documentation. 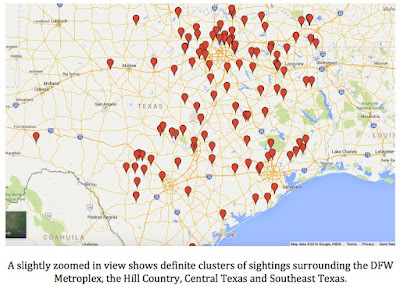 I started the Texas Cryptid Hunter blog in December of 2008. Almost from the beginning, I have been taking reports from people claiming to have seen an animal that mainstream science says does not exist, yet has lived in the mythology of Texas and the deep south for well over a century. 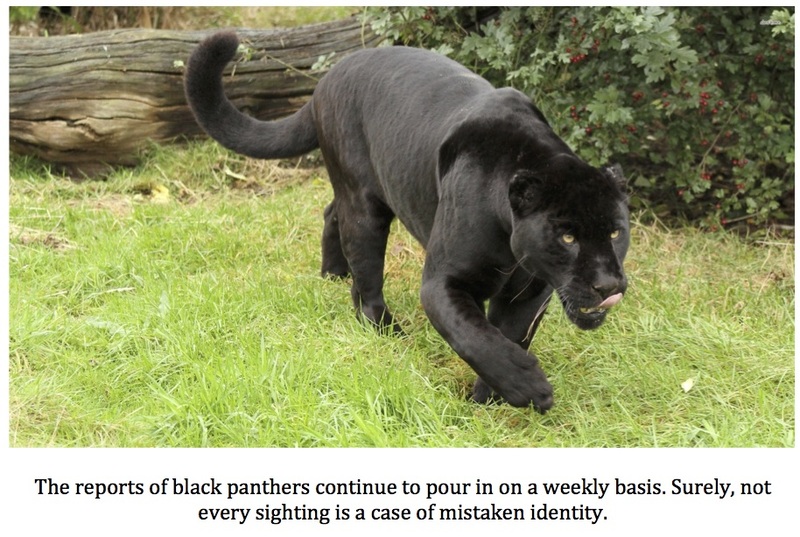 During the last six years and change, I have collected exactly 202 reports from witnesses claiming to have seen what is commonly referred to as a black panther. As long time readers of this site know, there is no such animal. The black panthers of the movies and that are seen on television are either melanistic leopards, which are native to Africa and Asia or melanistic jaguars, long thought to have been extirpated from all but the southernmost regions of the North American continent. Cougars, wildlife experts tell us, do not exhibit melanism and it is true that not a single documented case of a black cougar has ever been documented. Still, the sightings persist, they won’t go away and they show no signs of slowing down. I want to know what people are seeing and I resolved to do my best to get to the bottom of this mystery. This distribution map is part of that process. I have tried my best to place only the most credible of sightings on my map. 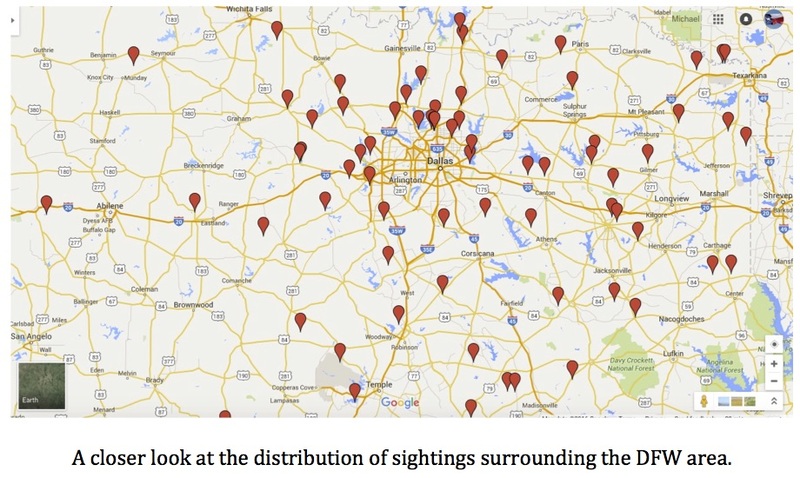 Of the 202 sightings in my archives, only 112 made it on to the map. I had some doubts about some reports, felt misidentification was likely in others and just flat out had a bad feeling about a few. The 112 reports on the map represent reports from people I feel were being honest with me and were of sightings of no known cat or, possibly, of a large species of cat far outside of its accepted home range. Is it possible that I kept some valid reports off the map? Yes, it is. Is it possible that some of the reports that made the map were from liars or hoaxers? Again, yes; however, I truly feel that the map represents sightings of real animals. I think once the distribution is examined, it will speak to that. 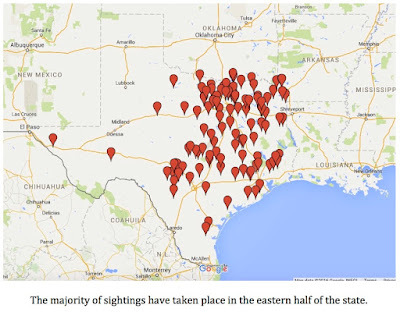 For example, the sightings are mostly confined to the eastern half of the state. This is the part of Texas that receives the most rainfall, where the major rivers of the state converge and is the most heavily wooded. This sounds like what a distribution map of a real animal would look like, in my opinion. I have provided several screenshots of the map here for your inspection. I have zoomed in on several major areas of the state and also provided a look at the entire state. You can access the online/interactive version of the map by clicking here. Hit the link and it will take you to the map. Once there, you can click on each pin that marks a sighting and a short synopsis of the sighting will pop up. I really like this feature and hope you will spend some time clicking on these sighting locations to see what people are seeing out there. I invite any of you out there to study the map and see if you can discern any patterns. Who knows? Maybe together we can figure this whole thing out. To the best of my knowledge, nobody else is tracking these sightings. I would ask that you all spread the word and let anyone who has seen one of these phantom cats know where they can report their sighting. In addition, I am looking for someone who has had repeated sightings on their property who would consider allowing me to place game cameras on site in an attempt to capture a photo of one of these animals. One good photo might just be enough for us to figure out what we are dealing with in regard to these enigmatic felids. Are jaguars making a comeback? Do cougars occasionally exhibit melanism? Do jaguarundis roam far farther north and get far larger than anyone suspects? Is there a new species out there just waiting to be discovered? If you are interested in allowing me to place cameras on your property, please contact me at texascryptidhunter@yahoo.com. That would also be the email address to contact me with a sighting. Reports of anomalous black cats, large in size with long tails, continue to pour in to me via email, comments to posts, Twitter and Facebook. I need to catch all of you up on these reports and thought I would work backwards to do so. What I mean by that is that I will be presenting the latest reports to you first and, over the next several weeks, get you caught up on the backlog. Before we begin, let me repeat a few things that I have said before. I know that there is no such animal as a “black panther.” The known big cats that have been given this moniker are either African leopards or New World jaguars exhibiting melanism. 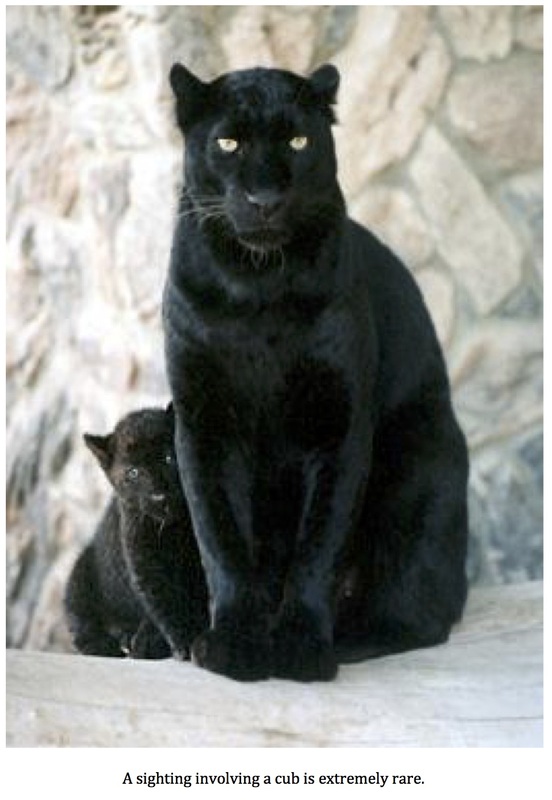 So, when I use the term “black panther,” realize it is a colloquialism, a catchall phrase, if you will, that is commonly used in Texas and the Deep South to describe any large, black or very dark, long-tailed cat. TCH Comment: An interesting account to be sure. I would be interested to hear how the husky reacted to the presence of the large cat. Surprisingly, the Plano area is a hotbed for sightings of large, black cats. The Arbor Hills Nature Preserve mentioned in this report is very close to other reported sightings. I would like to make clear that I am not trying to debunk reports of black panthers. I am simply following the evidence trail where it leads me. 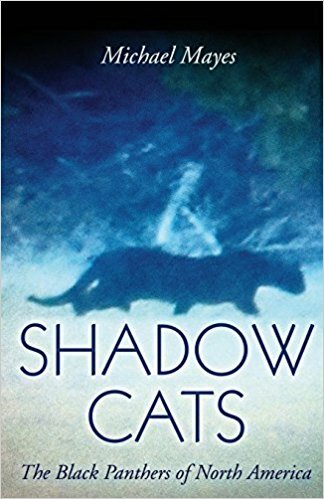 If anything, as time goes by, I am more and more convinced there is a legitimate mystery here regarding these cryptid cats that needs to be solved. TCH Comment: I find Johnny’s sighting very intriguing. He seems absolutely sure that the animal he saw was a cougar but stresses that it was an unusually dark brown. I feel strongly that at least some “black panther” reports can be attributed to sightings of cougars sporting unusually dark coats. “I live about 45 minutes south of Brazos Bend. I've seen a large cat three times in the past couple of years crossing the road. It's not much larger than a bobcat, more lean and longer, with a very long tail. It appears black until the light shines on it and then I saw that it was actually spotted. I've also heard what sounds like a woman screaming at night. TCH Comment: Brazos Bend State Park is located in SE Texas in Fort Bend County. Mainly, it is known for an abundant alligator population but it is a rich habitat that supports all manner of wildlife, including possible prey species for a large cat like white-tail deer, raccoons, otters, beavers, opossums, rabbits, etc. The witness mentions that the animal he saw looked like photos of jaguarundis he has seen online; however, his description does not seem to fit that species. His report of a lean and long cat fit the jaguarundi bill but the spotted coat and size reported (larger than a bobcat) do not. I’m not sure what this gentleman saw but I am pretty sure it was not a jaguarundi. Due to my doubts on this one, I will be leaving it off my black panther distribution map. TCH Comment: No cryptid cat here, this is a classic description of a bobcat. These wildcats are not an uncommon sight even in urban neighborhoods. Sounds like this bob was a very pretty and healthy specimen. TCH Comment: Eustace sits in Henderson County roughly 40-50 miles SE of Dallas. Cedar Creek Reservoir and Purtis Creek State Park are in the immediate vicinity as are numerous private lakes and stock ponds which provide plenty of water for a number of wildlife species. The county is rural and there is plenty of room for a predator of the size described to live and thrive. This account is interesting as a cub was involved. Kristi never mentions the color of either cat directly but does say a “tracker” felt she had seen a black jaguar. Based on that statement, I am going to assume the animal was very large and black. The rest of this “tracker’s” statement about the big cat having been some kind of hybrid between a jaguar and a cougar is nonsense, in my opinion. The basis of this theory being based on claw marks being found in a print is false logic. It is true that cats can and do have retractable claws but they do leave claw marks in tracks from time to time. While I find the tracker’s comments less than credible, I have no reason to doubt Kristi’s sighting report. TCH Comment: The description of the witness sounds a lot like a large domestic cat to me except for the estimate of the cat weighing 25-36 lbs. If he is accurate in that estimate, this was no feral/domestic. A jaguarundi certainly needs to be considered as a suspect here. The area described is on the E-NE side of Waco and gets rural and wild pretty quickly. There is a lot of brush, wooded areas, green belts and water sources along the Brazos River, Bosque River and Lake Waco shoreline. Certainly, there is enough suitable habitat to support a cat the size of a jaguarundi. TCH Comment: If there is ever an area where a cat the size of a jaguar could survive it is likely in the area of this sighting. Brazoria sits in Brazoria County and the spot of this visual is sandwiched between the Brazos River to the north, the San Bernard River to the south and the San Bernard National Wildlife Refuge and the Justin Hurst Wildlife Management Area to the east. The area has ample water and potential prey species, including the endangered Attwater’s prairie chicken, a type of ground-dwelling grouse. Rumors of large, black cats, like the one described by Dianne, are common in SE Texas. TCH Comment: Alto is a small town in Cherokee County in east Texas. The Davy Crockett, Angelina and Sabine National Forests are all nearby as are numerous wildlife management areas. 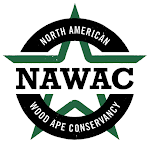 While Alto does not sit directly in any of these forests, it is in the heart of the Piney Woods region of Texas. The entire area is heavily wooded and rural. Tales of screaming black panthers from this area go back decades and locals will tell you in no uncertain terms that they are real. The description of yellow eyes is interesting. I have had a number of people use this description when talking about the eyes of a black cat. 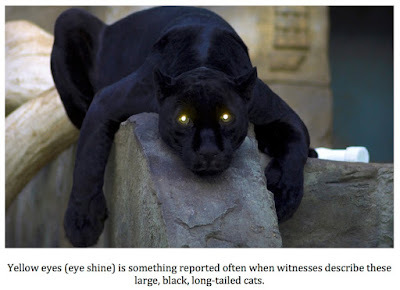 Since this sighting took place at night, it is possible this was some kind of eye shine and not the actual color of the cat’s eyes; still, the yellow eyes description pops up often enough to make me wonder. TCH Comment: This would be news as the Katy area is heavily populated and continues to boom. Do not let that fact fool you, the Brazos River cuts through the area only a mile or so south of this location and the landscape gets pretty lonesome pretty fast in that direction. A big cat could easily have been using the river as a travel corridor and ventured off course to explore or look for food. If the witness really was only 20 feet away they obviously got a good look at this animal. The estimated weight of 75-100 lbs. rules out any domestic/feral cat or jaguarundi. The cat being described as “dark brown” is interesting. Most people know the golden, tawny hue of a typical mountain lion. This description tells me that this cat did not look like that. A cougar with a significantly darker than usual coat could easily be mistaken for a black animal in low light conditions. This could certainly explain at least some black panther reports. “I have most certainly seen a large black cat in Dayton, TX. It was night time and my friend and I were in a field. We heard something so I shined the light over, and there it was just a couple of feet away from us. It turned and bolted extremely fast, but I’ll never forget how big it was or how long its tail was. Sighting was around September of 2010. TCH Comment: This is a pretty typical account that comes from an area of SE Texas with a long history of black panther reports. 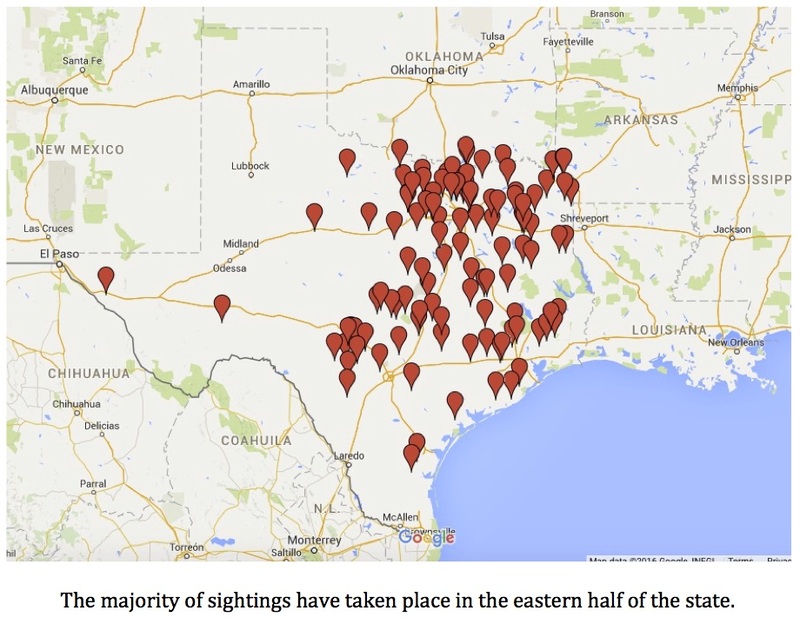 These anomalous cats are not considered anything unusual in this part of Texas. The description of a long tail would rule out most other types of wildlife and the witness clearly seemed rattled by the size of the animal. One has to wonder what that cat was doing creeping up so close to this witness and his friend. He might be very fortunate that he turned the light on the cat when he did. Please continue to report sightings of these phantom cats to me. I continue to work hard on my black panther distribution map and look forward to being able to share it with you all soon. It is a labor of love but a labor, nonetheless and, like most all of you, I have a lot of irons in the fire daily and time to work on it is hard to come by. Throw in the fact that about the time I get it up to date, another half doze reports comes in and it is almost a never ending cycle of updates. Still, it shouldn't be long.